San Francisco: It's an open secret that most people who buy SUVs never take them off-roading. Oh, sure, they might find comfort in the fact that their four-wheel-drive American MegaCrusher is capable of scaling the Andes in six seconds flat, but in reality the furthest they go off pavement is in the grass parking lot outside their kid's Little League baseball field. Heck, you could drive a worn-out golf cart to the same places most SUVs go. It didn't take carmakers long to realize this. That's why dealerships today are packed with things that look like SUVs but are, in fact, merely cars masquerading as tough trucks. The Honda Pilot for example looks like an SUV, but it's actually a lowly Accord that decided to wear a truck costume for Halloween. That's great if you want your SUV to drive like a car, which most people do. But what if you truly need a four-wheel-drive SUV that can help get you to the top of Mount Rainier? You consider the Nissan Xterra. The Xterra is one of only a handful of mid-size SUVs that stay true to their truck-like roots. It still has a true truck frame that gives it strength for bouncing over boulders, and its solid-axle suspension is designed to withstand brutal treatment on the trails. It's built like a Cold War military machine. Several downsides come with this off-road prowess, though. For one, the Xterra has a much bumpier, bouncier, harsher ride than its car-based counterparts. For another, its true body-on-frame design makes it feel like Jell-O when you hit a pothole, and it doesn't seem nearly as connected to the road as its car-based competitors with their more advanced suspension designs. Not surprisingly, it also drives like a Cold War military machine. That's not to say it's awful. It's actually far better than the first-generation Xterra that was sold until 2005, and Nissan surprisingly managed to increase off-road performance and on-road comfort at the same time. That's a huge accomplishment. 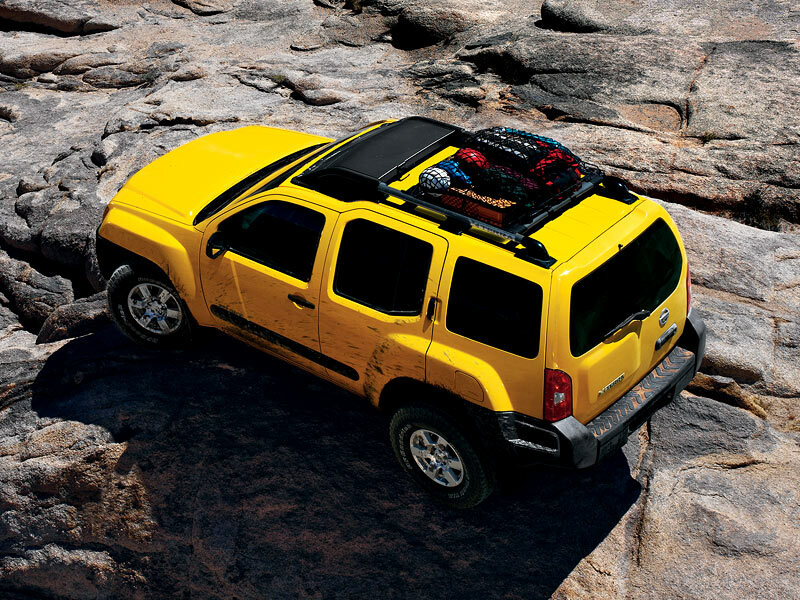 One of the Xterra's greatest strengths is its simplicity. You can't get leather seats, a DVD player or navigation system with it, but what you do get is a very well thought out, functional design. There are useful features throughout this SUV, including storage bins stuffed into every imaginable spot. The cargo area is brilliantly planned, with seats that fold completely flat and an easy-to-clean plastic surface that's perfect for hauling your filthy gear. You won't feel guilty throwing your muddy boots in the back because it's so fast and simple to wipe it clean later. There are a total of 10 hooks for tying your stuff in the cargo area - six on the floor and sides and four on the ceiling - plus an adjustable channel system in the cargo floor designed for securing bike racks and other accessories. Price-wise, the Xterra ranges from the low $20,000s to around $28,000 depending on which model you choose. All versions come with the same 4.0-liter V6 engine that makes plenty of power. Overall, it's good to know you can still buy an SUV that does all the cool things SUVs were originally built for. It's a real do-anything, go-anywhere vehicle - and that's becoming a rarity. What was tested? The 2007 Nissan Xterra Off-Road 4x4 with a base price of $27,200. Options included: XM satellite radio ($350), Rockford Fosgate audio package ($900), carpeted floor mats ($110), side curtain air bags ($700). Price as tested including a $605 destination charge: $29,865. All the Xterra's controls are logical and within easy reach, but hard plastics on the dash feel like they came from Fisher-Price. Why avoid it? It drives like a true off-road SUV, with a bouncy, harsh ride and truck-like heft. 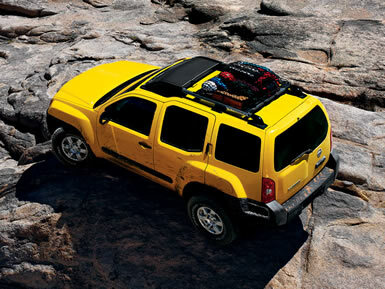 Form follows function in the Nissan Xterra. The boxy body shape wraps around its truck-like frame for good clearance driving over boulders and through the woods.